Why should you diversify your portfolio? How to quantify the diversity? How do we know when enough diversity has been achieved? In the last column we compared a large number of mini-strategies using back-testing. If you missed that column, here's a link to it. The question we left open was how should we select the components in a portfolio in a way that maximizes our forward-looking risk-adjusted returns. Over 50 years ago, in 1952, a young finance student in the University of Chicago wrote a 15 page paper with the unassuming name "portfolio selection." The paper, which was largely overlooked at the time, laid the foundation to what came to be known as "Modern Portfolio Theory" (MPT). 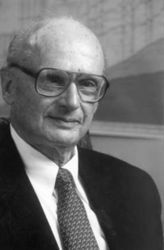 It took almost 40 more years for that student, Harry Markowitz to be awarded the Sveriges Riksbank Nobel Memorial Prize in Economic Sciences [footnote #1] for this and his other pioneering work on MPT, and making economic decisions under uncertainty. Harry Markowitz analyzed, quantified, and answered the question "Given possible components, how should an 'optimal' portfolio be constructed from these components?" An optimal portfolio is one that provides the highest expected-return for a given amount of assumed-risk, or conversely that minimizes the assumed risk for a given expected return. For example: assume there are many different portfolios which are expected to return 10%/year, based on their long term historical averages, but some of them may fluctuate a lot along the way (i.e. be more risky than others). The best of these 10%/year portfolios is one that returns the 10%/year in the straightest line possible, i.e. one that is the most consistent in shorter periods as well. There's more to the theory, and there were other contributors (William Sharpe, Merton Miller) so I won't try to recite all of their work here. Those interested can read more on Modern Portfolio Theory, and the "efficient frontier" on Wikipedia. When I ask people "why should you diversify your portfolio?" It seems that everyone intuitively grasps the first reason: reduction in risk. Yet many, or even most, misunderstand the second effect of diversification: increasing long-term returns. To most people these two aspects seem contradictory: since they know that, as a rule, risk is inversely correlated with return. The uncertainty factor; not all risks increase returns, and one can always be wrong when picking bad risks - gambling and the lottery are good examples. Since in investing, nothing is ever guaranteed, diversifying is a simple probabilistic way of making random unpredictable moves of components within the portfolio cancel each other on average and achieve a uniform as possible return per unit of time. Keeping periodic returns as uniform as possible, as we saw above, maximizes long term returns by compounding the small returns. As you can see, ETFs like EZU and IEV have been almost identical in their movements (correlation = 0.99). This begs the question: why not pick just one of them for our portfolio. Going from 8 ETFs to 9 ETFs here, contributes almost nothing to diversification. Harry Markowitz had observed that mixing less correlated assets leads to reduced risk, and better long term returns. He formalized the problem like this: given a set of M components, each with a history of returns, and variations in these returns, plus the correlation-matrix of returns between these M components, can we pick N out of M (where N <= M) such that the portfolio will be close to optimal, as we defined it above, on a risk adjusted basis? Markowitz then went on to prove that the lowest risk portfolio is the one where the NxN correlation sub-matrix has the smallest mean correlation between components. Thus the term "Mean Variance Optimization" (MVO) was born. Maximizing the variance within a portfolio is equivalent to minimizing the portfolio matrix mean correlation [footnote #3]. For convenience, the correlation matrix above is sorted from left-to-right (and top to bottom) from the least correlated component (relative to all others) to the most correlated one. This makes it easy to look at strict subsets of the whole portfolio. We could drop any right-end subset of the components and be left with a less redundant portfolio. For example: drop the leftmost 3 components: (EWQ, IEV, EZU), and remain with only 6 components (instead of 9). Net result: a more diversified portfolio! Yes, sometimes less is more. Thank the long bull market for this. Despite all the components moving together in unison, it managed to do just fine. The question is what would have happened if a downturn had hit. What this shows is that sometimes more components can only hurt performance (even when ignoring increased commissions, and complexity) and that a lower-correlation is good for a portfolio. This is just one data point, with a larger search, I am able to find all kinds of examples, some better, some worse than the top-N portfolio. I hope to be able to collect more data in the future that will help me to better quantify the advantages of good mixing. Please don't buy this portfolio today. The present optimal picks are very different. One of the present best mixes is published below. Please don't rush and buy these, buying leveraged ETFs after extreme moves up is an invitation for disaster. The correction has been overdue after several strings of new highs in the broad indexes. Since earnings for the most part have been good, and I see no global signs of slow down yet, I feel it would be premature to call this a new bear market. It had all the markings of a sharp correction: panic, big drops, very high correlation between most ETFs. If this is a correction, this may be a good opportunuty to buy high quality ETFs which you may have wanted to buy anyway, at a discount. With that in mind, here are last Friday's (Aug 3, 2007) rankings (top 40 ETFs among about 500). Note: both ranking and portfolio updated late Friday night with more up-to-date results. The suggested optimal portfolio was optimized targetting maximum alpha/beta vs SPY. A target function which seems to produce the best portfolios of all those I tried so far. 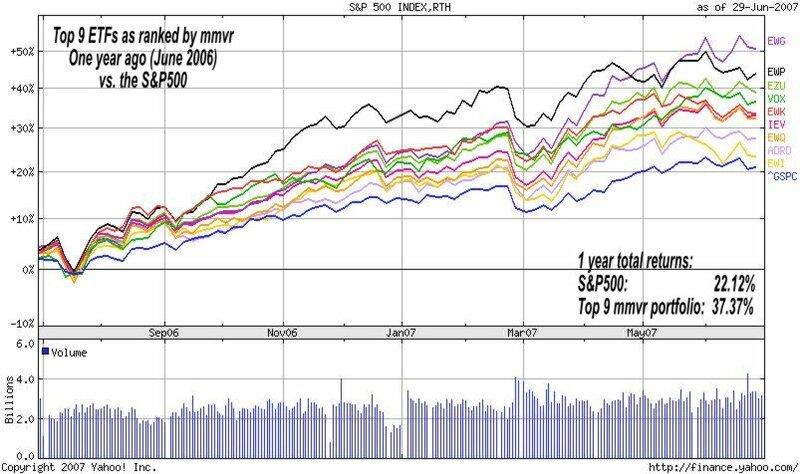 Assuming this is a temporary set-back, here's a good forward-looking very minimal portfolio (only 7 components) picked on 2007-08-03 by combining MMVR ranking with a "maximum alpha/beta_squared vs the SPY" optimization. The output includes a 24-week back-testing of the portfolio. Based on recent performance, including the recent correction (remember: past performance is no guarantee for future performance) this portfolio looks less risky than the SPY (smaller standard-deviation, 19% smaller worst week, 5% less beta, & only 0.64 mean internal correlation) and has a much higher weekly mean return, a 36% alpha, and better risk adjusted return characteristics. In the next column, we'll take a little break from our usual course, and try and answer some very good reader questions. If you have one, please email me and it might make it to the next article. As always, I hope you found this column useful. Feedback, good or bad, is always more than welcome. An even more obvious example would be two investors, one who completely shuns risk and just wants to preserve his capital (i.e. one who targets a stable "no pain, no gain": 0% per year return) vs. a gambler who loves taking extreme risks. The latter just loves "excitement" and is thrilled to either double his money or lose it all in any given year with equal probability. Both investors have the same simple "average" return of 0%/year since (100% - 100%) / 2 = 0%. After a few years the gambler may have doubled, or quadrupled his money, but eventually, inevitably, would hit the bad luck draw of -100% and lose all his capital. At this point no doubling would ever get him out of the hole of total ruin since 0 * N is always 0, regardless of N. Obviously, given enough years the risk-averse 0%/year investor, would be way ahead. Optimally selecting N components out of M has a deceptively simple sound to it. Yet, for moderately large numbers N, M it turns out to be a pretty hard selection problem. For the sake of brevity I left the details out of this article. Interested readers may read this separate more technical article in which I describe two algorithms I have implemented to construct forward-looking, near-optimal portfolios. The theory behind these 2 algorithms is sound, and the back-testing evidence of both of them selecting good portfolios is strong. My current favorite is to optimize for minimum correlation using simulated annealing. Note: all the experiments described above were run at the end of June 2007. All the portfolio picks: i.e. both the top-9 portfolio selection and the 6-out-of-9 low-correlated selection were done based on data available on June 30, 2006 (i.e. a year earlier). In other words: the selections did not rely in any way on future (at selection time) data. The actual results are the actual statistics on the year that followed both selections (June 30, 2006 to June 29, 2007) i.e. what we know in hindsight. footnote #5: How did the smaller, less correlated portfolio do? If you guessed that the 6-component portfolio did better than its 9-component superset, right you are!